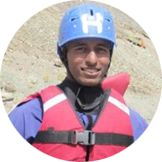 On his 24th birthday, Arun Koundinya is a commissioned Officer in the Indian Air Force. He was commissioned in June 2011. Looking at this brilliant, active and fun-loving young man, one would think he is a product of one of those high profile public schools. Far from it, the fact is that his childhood and adolescent years were nothing more than pain, anxiety, uncertainty and struggle. Arun&rsquo;s family broke up when he was hardly 4 years old. He lived with his father, SR Koundinya in Hyderabad. Koundinya was a very brilliant and well-read man and worked as a freelance journalist. Arun had an elder sister, Sarah. They both attended the local school. His father died of a massive heart-attack. Since then Arun was being educated by Navajeevan, Vijayawada. He obtained B.Sc Degree in Mathematics, Electronics and Computers. By then, Arun had a desire to get into some good government service, especially Air Force. So, he used to keep looking for ads in the newspapers inviting applications for government services. One day, he saw an advertisement from &ldquo;Indian Air Force&rdquo; for Ground Duty Officers Course (GDOC). He applied for it, cleared the written test and the various interviews. He passed all the tests and got selected on merit for GDOC. Just then, his Degree results were also declared in June 2010. To his hard work, he secured 62% marks. Immediately, he joined the Course at the Air Force Academy, Hyderabad. On 18th June 2011, he completed the training and became a Commissioned Officer. Believe it or not, Arun is now all set to conquer even the greater heights. 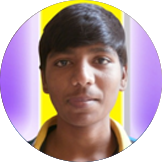 Chantamma worked as a labourer till the age of nine. 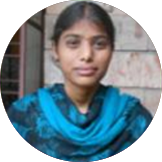 Today, at the age of eighteen, she is doing Engineering in the prestigious Indian Institute of Information Technology (IIIT), Nuzivid, and Andhra Pradesh. On asking how she achieved this feat, she only blushes! “It.s all due to Don Bosco Navajeevan, Vijayawada and Fr. Thomas Koshy” She was born in a small village of Chigudipadu in Krishna District of Andhra Pradesh. Her father Kantha Rao and mother Lakshmi Kandamma were both agricultural labourers. They belonged to the Madiga community (traditionally engaged in shoe making). Chantamma was the youngest of the three daughters of her parents. They lived in a small house allotted to them by the government under the housing scheme. They had no land of their own. Since her father often suffered from ulcers and her mother got frequent attacks of migraine headache, they could not go for work regularly. As a result, Chantamma had no time to go to school. During the anti-child labour campaign in 2002 at Chigudipadu Village, She came in contact with Ms. Syamala, a social worker and ex-staff of Navajeevan. Ms. Syamala convinced her parents to educate the girl at Chiguru, Navajeevan. At Navajeevan, Chantamma was admitted to the residential Bridge Course for girl children called Sethu. She had to begin with the alphabets. 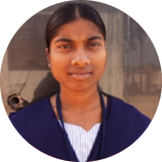 Navajeevan kept providing all the necessary support towards her education. She was a very quick learner and a rank holder every year. Finally, in 2011, in Class X, she gave a stunning performance, scoring 547 marks out of 600. On the basis of Government Scheme for meritorious rural students of SSC, she grabbed the opportunity to make her entry into prestigious Indian Institute of Information Technology, Nuzvid, Krishna District, on scholarship. I am Bantumilli Durga, 15 years old. My both parents died when I was very young. I am from S.Kota, Vizianagaram distrist. My mother died when I was five day old baby. And my father died when I was 15 years old. I have an elder sister, who was also supported by Navajeevan Bala Bhavan. I was rescued by BVK (Bala Vikasa Kendra) field staff of Navajeevan while wandering in Auto Nagar Industrial Area, Vijayawada. Subsequently, I was shifted to Sethu (Girls’ home in Penamaluru) for bridge course. Thereafter, I was mainstreamed into the regular school. I was very happy to go to school. I never expected that I can go to school like others. It was a blessing in disguise for me. Later on, I was motivated by my teachers to work hard and do well. I was equally supported by Fr. Koshy and the follow up staff. As a result, I got first marks in the school with 90%. I was the happiest person in the world. Then, I joined in the best college to pursue my Intermediate. I am proud to say that I secured college first in the intermediate exams. I want to become a doctor and serve poor people who are in need of support. Now I am preparing to appear for EAMCET and become a doctor. Thank you Navajeevan for helping me stand on my own and being with me to start my life from the scratch. My name is Gangula Jaya Chandra. My father died with HIV/AIDS. My mother is also infected with HIV and she is a domestic worker. I am the native of Darsi Village, Prakasam district. I have a younger brother, who completed 10th class in Navajeevan Bala Bhavan. My family is economically poor and deprived of support. I have a dream to become an Engineer right from my childhood. Therefore, I have been always securing the highest marks in very level of my studies against all odds in my family and my personal life. I am now preparing to write EAMCET and join in Engineering. I am able to achieve my dream because of Navajeevan, which I treasure it as a gift for me. It has given me new life and I will remain thankful to all those who have been supporting me to realize my dream.